Thrush Turbo Muffler Reviews - Is This the Best Cheap Muffler? Note from Ryan: Use the table below to find the correct Thrush Turbo muffler configuration for your car or truck. Not sure which to choose? Follow links to check vehicle fit on Amazon. Thrush has been around for over 40 years, tracing its roots back to the early days when hot rods were all the rage. Enthusiasts demanded high quality parts and turned to a company that could complete the equation. With all the competition on the market today, Thrush still retains a loyal consumer base when it comes to performance mufflers. From glasspacks to headerback systems, one of their top products is the universal Thrush 17715 Turbo muffler. Don’t let the turbo part of the name confuse you, the muffler is compatible with naturally aspirated systems. 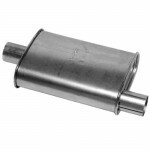 Available from 2 to 3 inch openings, this muffler was designed with value and versatility in mind. 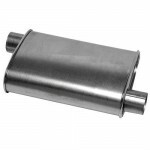 The shell is coated with 100% aluminum for rust protection and in addition, to cut down on cost and weight. 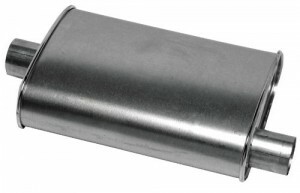 The muffler’s oval body is 16 to 25 inches long overall and weighs less than 5 pounds. Without any polishing done, you can expect the body to have a dull matte finish. While the exterior is relatively plain Jane, the interior boasts a tri-flow design that cuts down on backpressure allowing an increase in air flow efficiency. The quicker the air flows in and out, the more horsepower one can gain. Owners describe the sound produced as low and mellow, a noticeable change above stock while maintaining a reasonable noise level. An important thing to note is that the openings are not completely lined up. One opening is centered while the other is offset. The orientation during installation is completely up to you since the muffler is considered reversible to allow different configurations. 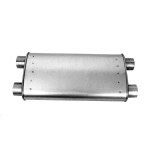 The price point is lower than many other mufflers on the market today. Thrush mufflers are the more economical solution to your upgrades and they provide a 90 day warranty to cover any immediate issues. But, you’ll get so much more than just a great deal with a Thrush muffler. You may also see increased performance an better sound. Good business comes with satisfied customers, and Thrush has no shortage of that. With the sound construction and appealing price point, it’s good to know Thrush is still keeping with the times in their own way.